In stock! We have 13 of these ready for immediate dispatch or more available on demand. 500mm wide and 952mm tall with a projected towel bar. Perfect for small shower rooms. Made in Europe with a 10 year guarantee. Exeptional design and quality bathroom radiator and towel warmer. 500mm wide, 952mm tall and 225mm deep. 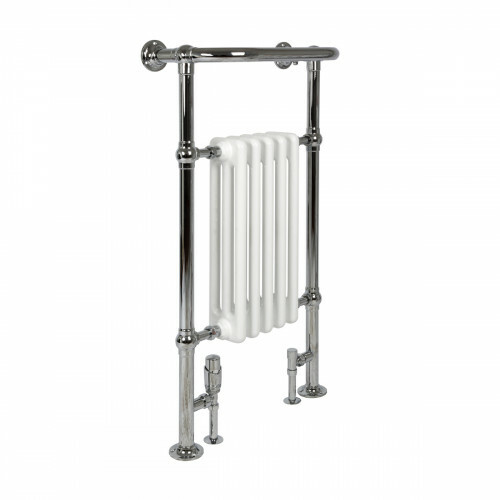 Chrome plated frame including projected towel warmer bar with white tubular steel insert. Made in Europe to ISO 9001:2008 and EN442. Pair with All Chrome TRV valves for self-regulated heating or manual Chrome Angled Crosshead valves. Finish with Chrome shrouds and base plates to cover the copper pipe.